Cameroon born youngster Samuel Umtiti is widely considered as one of the best young defensive prospects in Europe, and for good reason too. The likes of Arsenal and Chelsea are both reportedly keeping an eye on the progress of the 20-year-old. 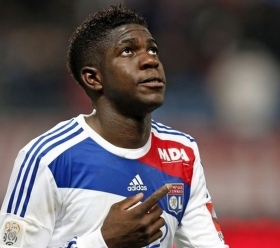 Umtiti, who is comfortable playing at full back or in the centre of defence, shot to fame since making his debut for Lyon in 2012. Since then, Umtiti has gone from strength to strength and many now credit this youngster with having international honours destined for his future. The defender, who prefers playing in the centre of defence instead of at left back, is known for his pace and mazy runs down the flank. He burst onto the scene in a Europa League goal against Tottenham back in 2013, when he score an absolute cracker of a goal against the Premier League side. Having played for France's under 17, 18, 19, 20 and now under-21 side, it is highly likely that Umtiti will eventually be a part of France's full international setup. The World Cup in Brazil is probably a little too soon for the 20 year old, but one thing is for sure, he will definitely be an important member of France's international ambitions for many seasons to come. Arsenal and Chelsea have both sent scouts to watch Umtiti in action. There are many rumours suggesting that both London clubs have eyed the defender as a potential addition to their defences. Umtiti's versatility is certain to keep many top level coaches interested in the player. Also at his young age there are still many years for the starlet to learn more about the professional game.